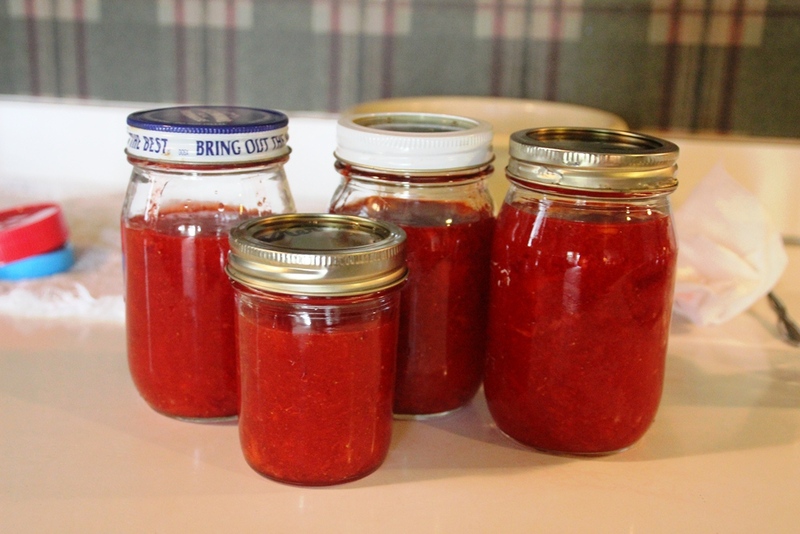 Several years back, Grandmother and Aunt Anna introduced me to strawberry freezer jam, which I of course ate on a warm biscuit for breakfast just as I normally do with other homemade jams. It didn’t take me long to realize that this was basically strawberry shortcake in breakfast form. Let me show you how to get some of this in your life. First, we make the jam. 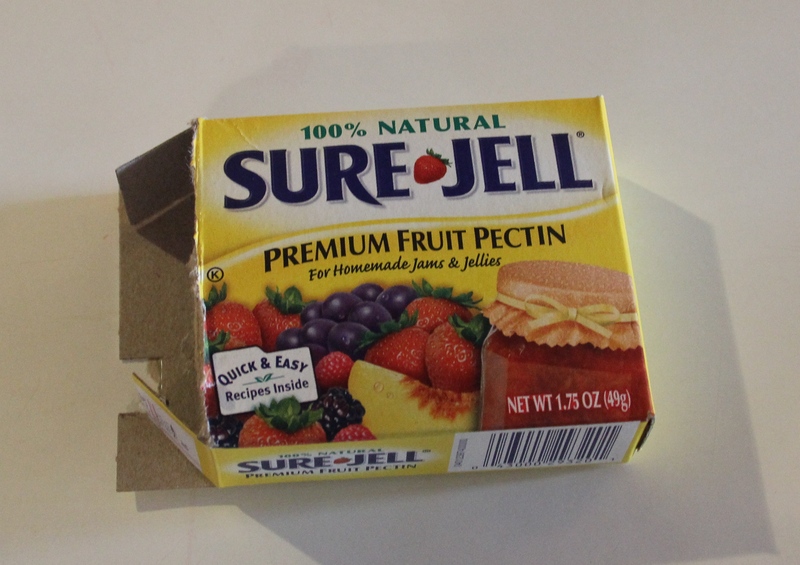 You will need fruit pectin to make the jam nice and thick. You may need more than one package, depending on how many pints of jam you would like to make. The instructions for how to make this jam as well as the ingredients and their quantities can be found in this box or here online, but I will take you through the steps with pictures because I think you’re swell. 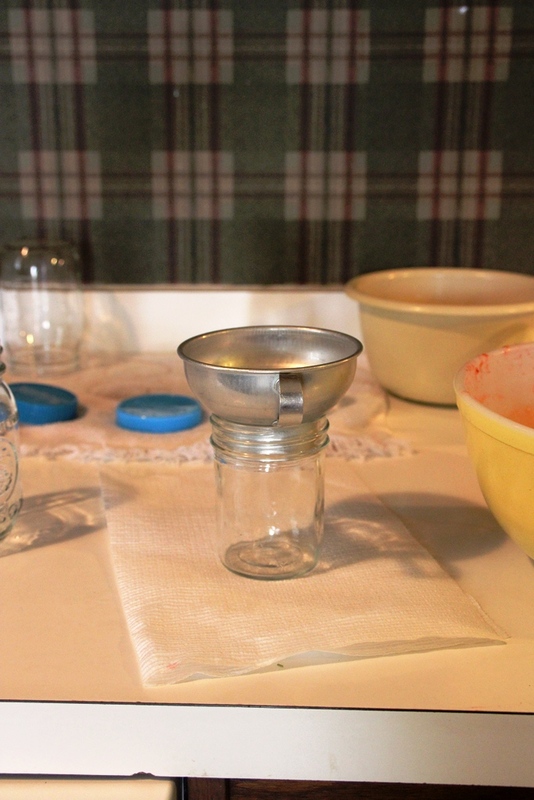 You will also need some clean mason jars with lids. I forgot to take a picture of these, but I’m sure you know what they look like if you’re interested in making jam. Next, you must procure some strawberries. But not just any strawberries. 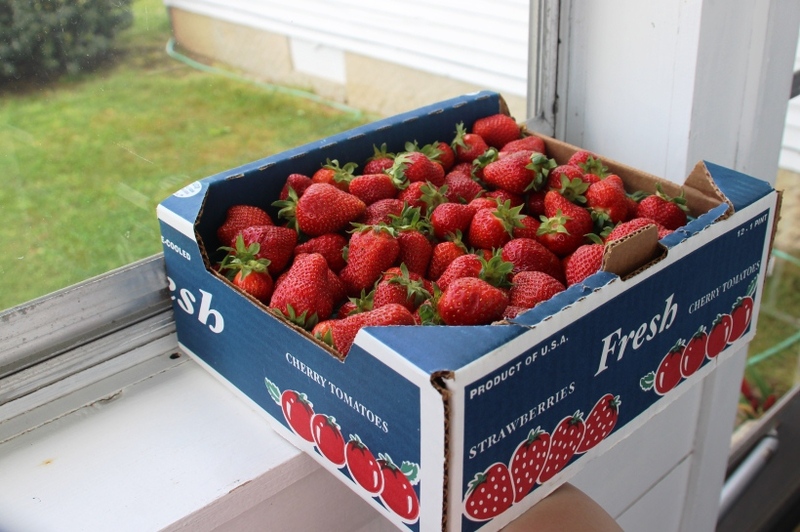 It is absolutely CRITICAL that you start with fresh and perfectly ripe berries. If you do a little drive-by test with your nose, you should be able to smell their sweetness. It also doesn’t hurt to take a bite of one of the berries to confirm that on the inside they are not tough and white and tart, but instead juicy and red and sweet. You don’t actually need this many berries unless you want to make over a dozen pints of jam, which you very well might once you taste this jam on a biscuit. Grandmother and I got a little ahead of ourselves on the quantity of berries we purchased and probably only used ¼ of this box for 4 pints of jam. We did, however, manage to eat the leftover berries for dessert in the form of strawberry shortcake just to mix things up. Ha. Once you have determined that these berries are indeed perfectly ripe and sweet, please wash them. 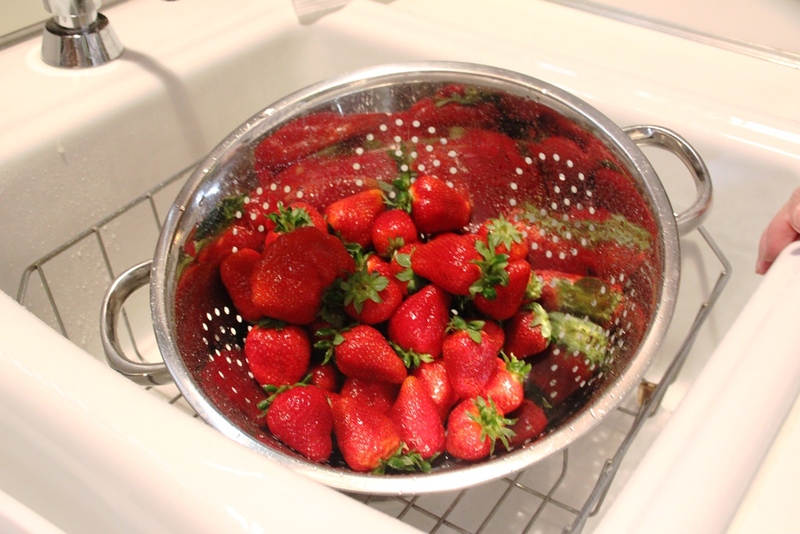 Then, hull the strawberries to remove the greenery. Measure out 2 full cups of strawberries. Really pack them in so you maximize the strawberry-ness. 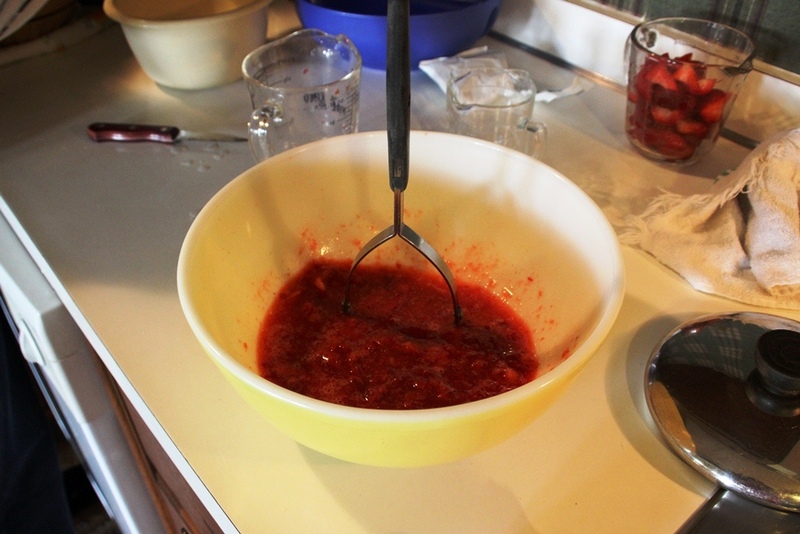 This is the fun part (other than the most fun part: eating the jam): Mash the strawberries until completely broken down. I suppose there are several ways to do this, but a potato masher is my weapon of choice. 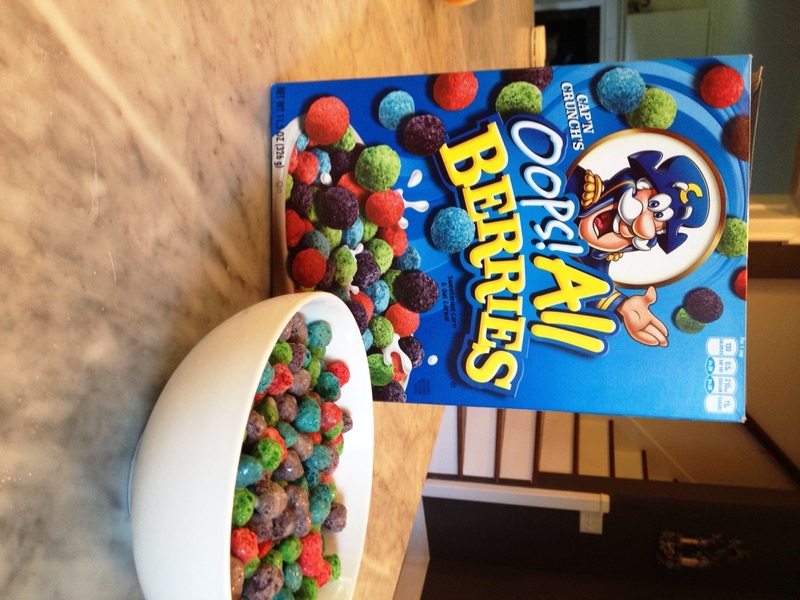 Once the berries are mashed up well, add an absurd amount of sugar (4 cups). 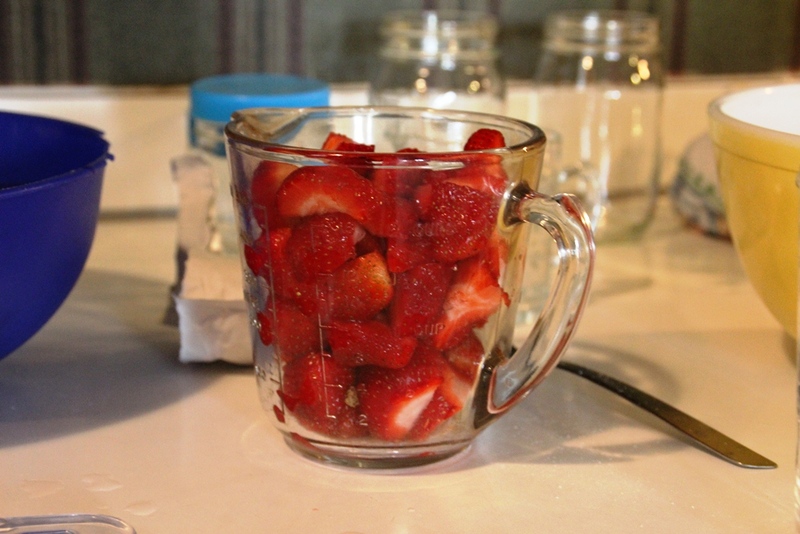 Mix the sugar into the berries until dissolved and give them some alone time for 10 minutes. Stir the mixture every now and then and make sure they are behaving. 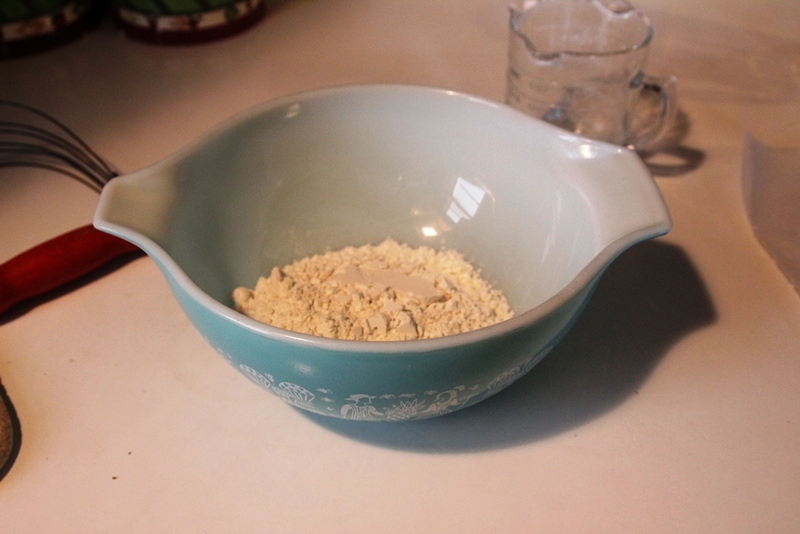 Meanwhile, pour the package of pectin into a small pot and add ¾ cup of water. Bring to a boil over high heat and stir the heck out of it so it doesn’t stick and burn or lump up. 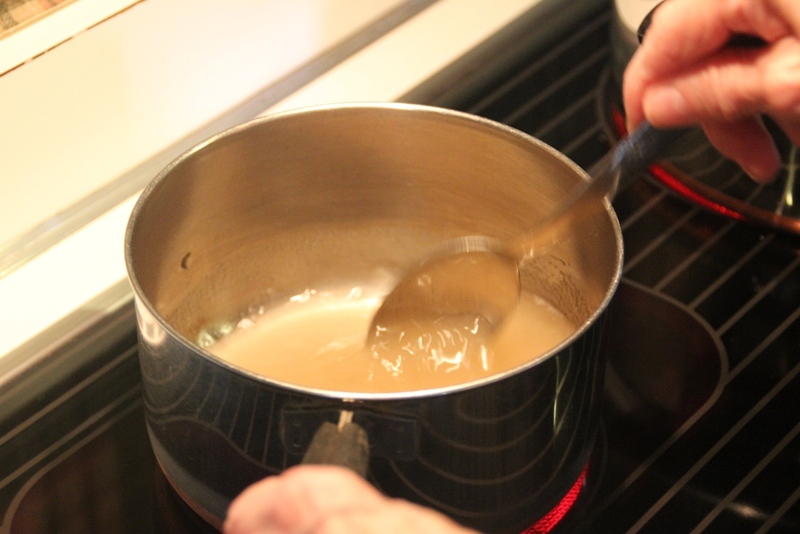 Once the mixture starts to boil, continue cooking for 1 minute and you’d best not stop stirring. 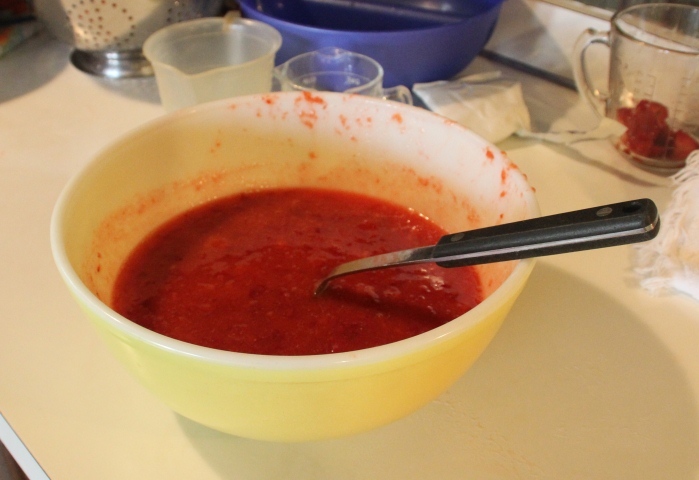 Then carefully pour the hot, thickened pectin into the strawberry mixture after its 10 minutes is up. (Its dissolving 10 minutes, that is. Its 15 minutes of fame, however, has only just begun). 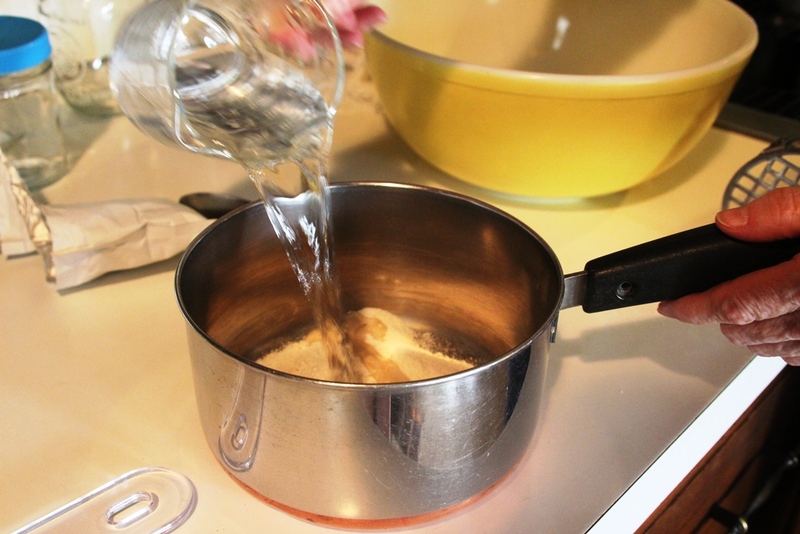 Stir this mixture for a few minutes until everything is dissolved together. 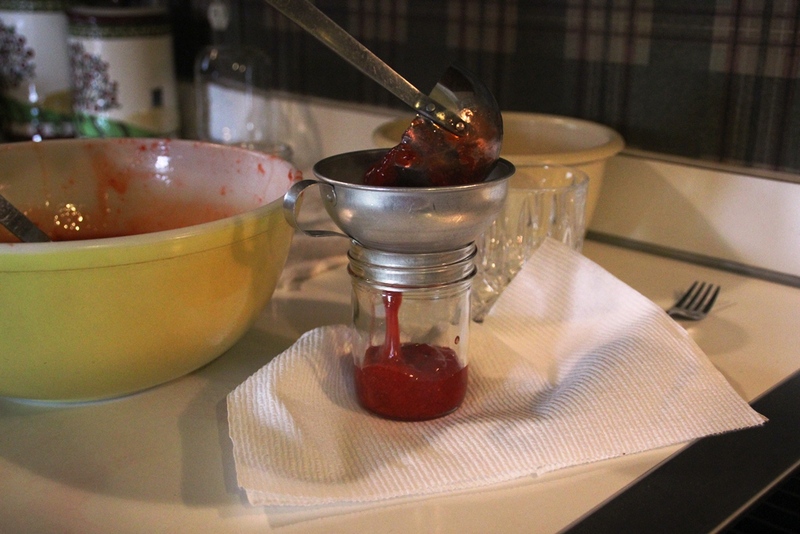 Next, please save your heart some ache and use a funnel when pouring the jam into the jars. This will drastically reduce the amount of jam that spills onto your counter, your paper towel usage, and, of course, the amount of jam that tragically will never make it to a biscuit. 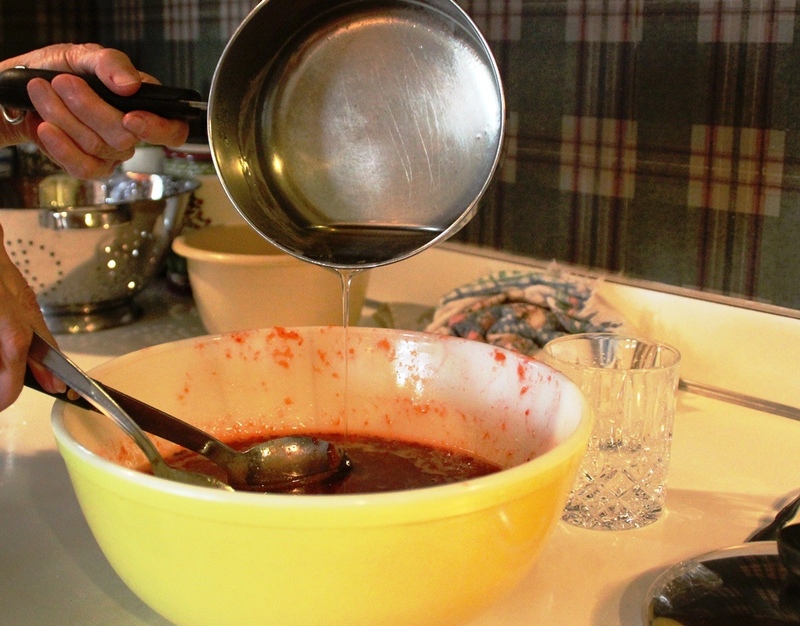 Using, a ladle, pour the jam into the jars, leaving at least at least a half an inch below the rim of the jar as the jam may expand in the freezer. Though it is tempting, filling the jars to the top with jam may lead to a misfortune similar to that warned against in the previous paragraph regarding the funnel. 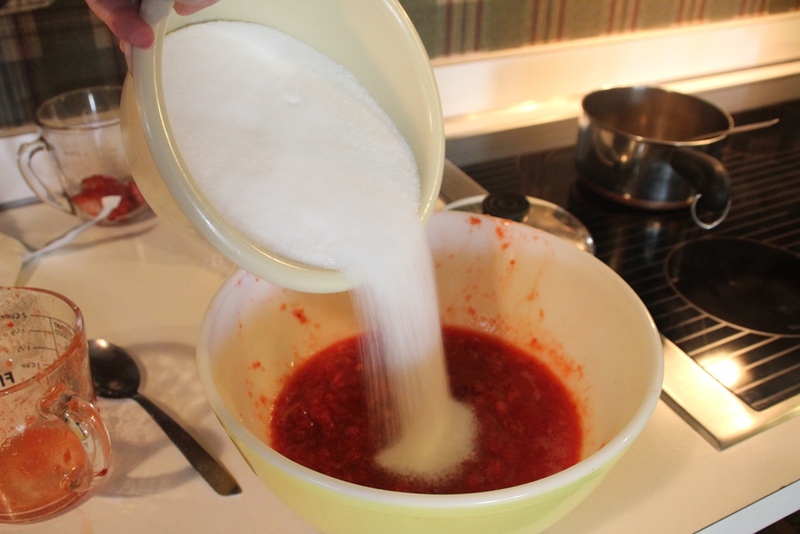 Once you have successfully ladled all of the jam into the jars using a funnel, place the lids on the jars and allow allow them to sit on the counter for 24 hours before putting them in the freezer. These keep for up to 1 year, which means you can enjoy this piece of heaven on a biscuit in the dead of winter. Speaking of biscuits, let’s make some so we can eat what is effectively strawberry shortcake for breakfast. These are Grandmother’s wonderful biscuits. They are small in diameter and relatively flat, which maximizes the surface area that develops a nice crust and minimizes any fluffy nonsense that gets in the way of the jam to biscuit ratio. For the record, I have nothing against fluffy biscuits. I actually prefer them with sausage gravy because they sop up all of the savory wonderfulness sausage gravy has to offer. So, I guess it’s a texture thing. ANYWAY, you would probably like me to stop blabbering on and tell you how to make the perfect strawberry freezer jam companion biscuit. 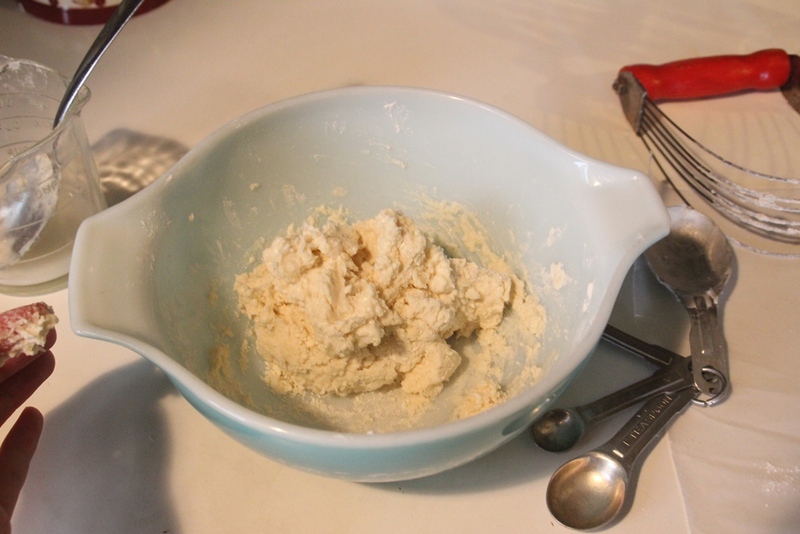 First, measure out 1 cup of flour and dump it in a mixing bowl. 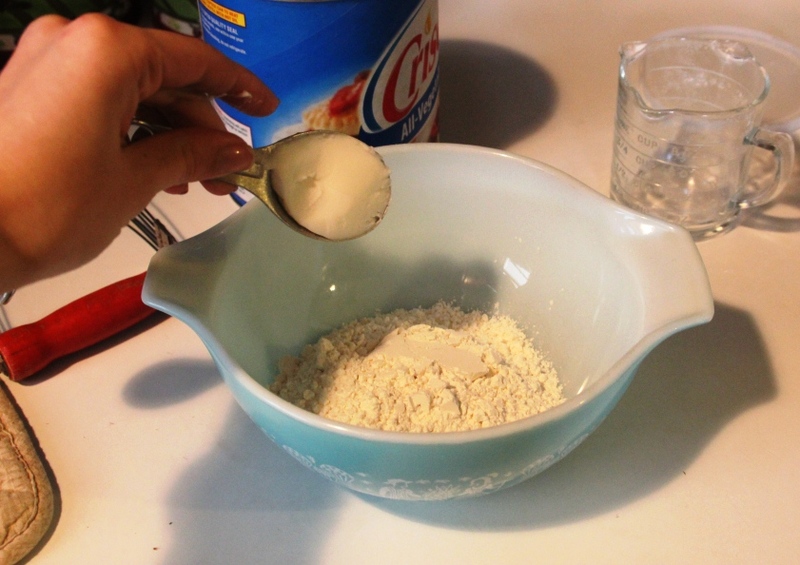 Then, please tell everyone to avert their eyes as you add 3 tablespoons of vegetable shortening (Crisco) to the bowl. 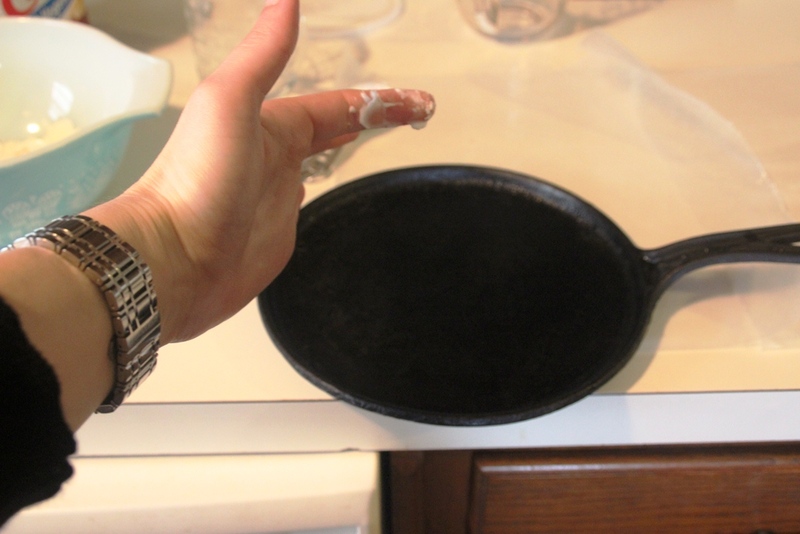 After you’ve extracted the shortening from the measuring spoon using CLEAN fingers, use your Crisco-ed finger to grease the flat cast iron skillet. This was my great-grandmother’s and it’s the only skillet I’ve ever seen Grandmother use to bake biscuits in the 23 years that I’ve been enjoying them. 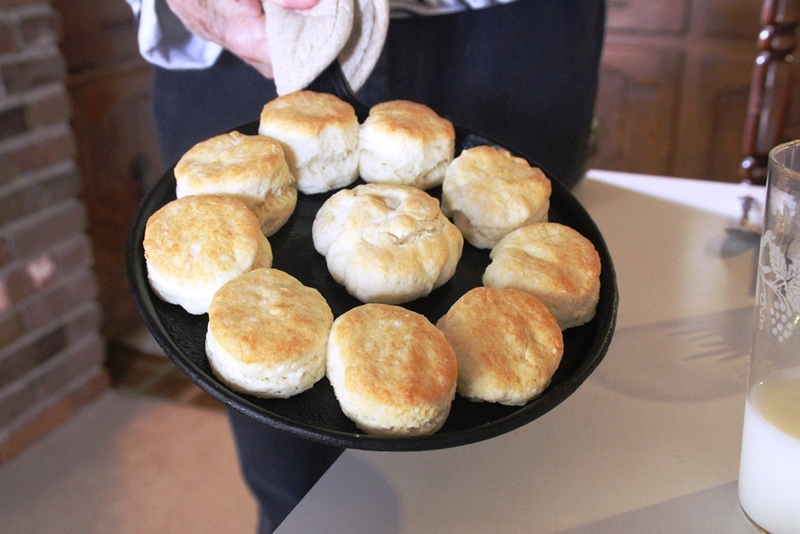 Translation: This skillet is very old and results in delicious biscuits without fail. Try to find yourself one immediately. 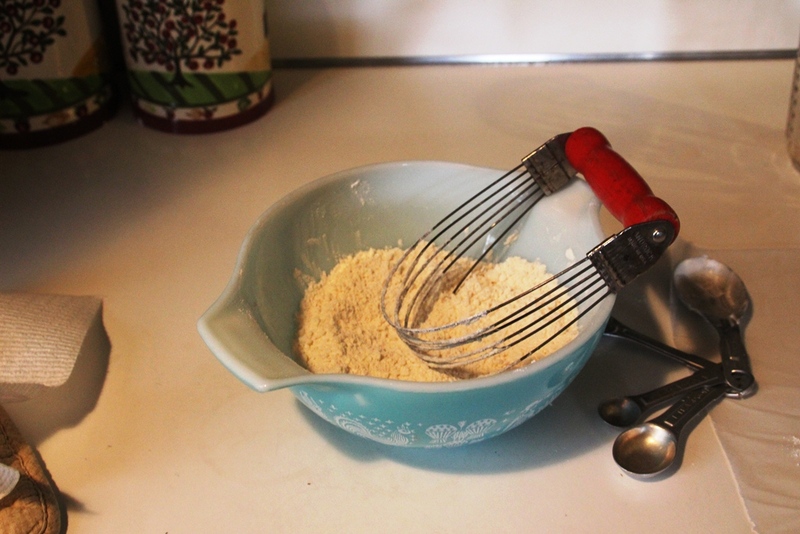 Using a pastry blender, cut in the shortening until the mixture resembles a coarse meal. Add about 1/3 cup of milk and stir the ingredients together until combined. It’s best to add most of the milk and hold a little bit back until you can gauge the moisture level of the dough. You want it to be moistened, but not overly sticky or wet. 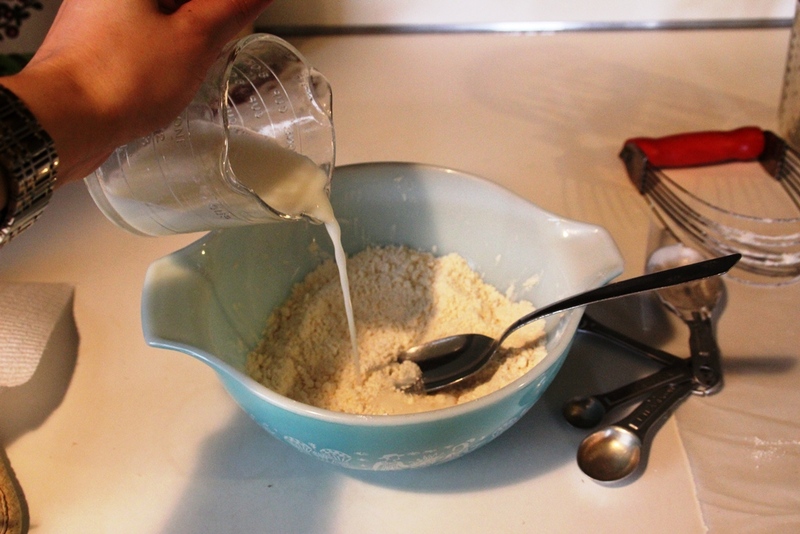 Using your hands, knead the dough 4 or 5 times and add more milk if necessary. Don’t overwork it, but knead the dough until it looks right. It looks right when it looks like this. 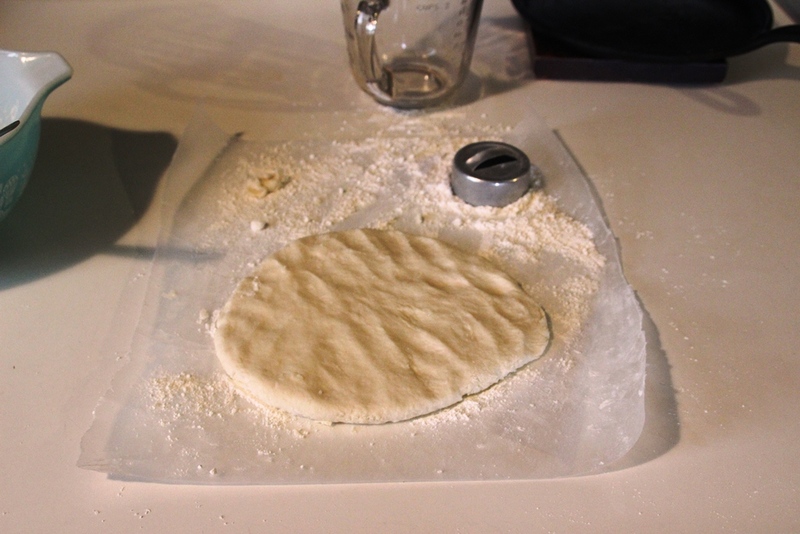 The turn out the dough onto a floured work surface and press it down until it’s about ½” thick. Or, if you’re real fancy, use a rolling pin. Then, use a SMALL biscuit cutter to cut out the biscuits. (See tangent above for rationale). 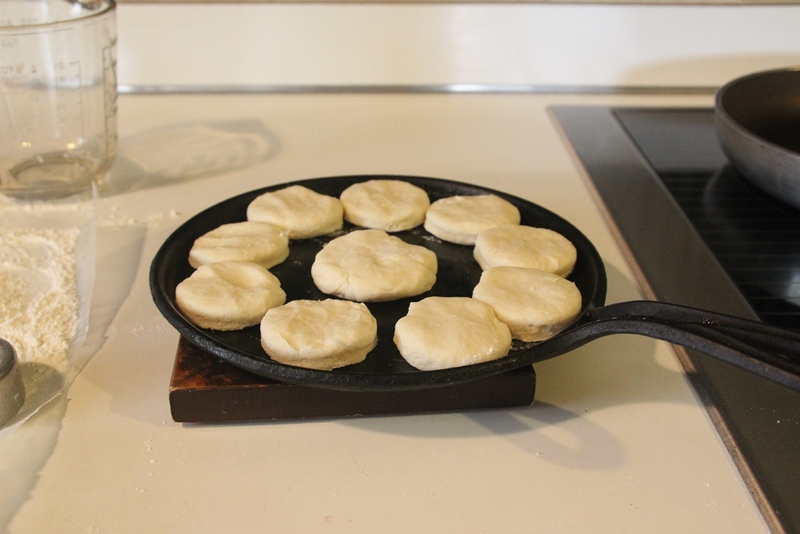 Place the cut out biscuit dough on the greased skillet and pop it in the oven on 425 until biscuits begin to turn golden brown, about 10 minutes. These actually rose more than normal, but they still tasted good. 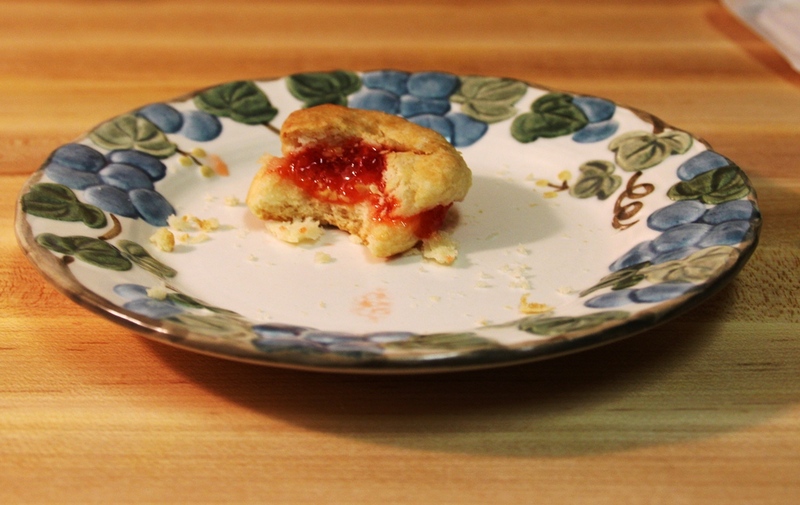 This is what the biscuit and jam (and butter if you’re absurd like me) looks like assembled and partially eaten. I had to take a bite to show you what it looked like on the inside. That, and I was so excited I forgot to take a picture until I had taken a bite. That’s what strawberry shortcake for breakfast can do to you. Or, FOR you, depending on if you are a biscuit half-eaten or half-left-to-eat kind of person.